Joseph “Joe” Jackson was born in Talladega, AL to the late George and Iva Barclay Jackson. He received his elementary education in New York and Ohio. In 1955, he graduated from high school in Ohio. After finishing high school, he returned home to Talladega, AL. There he served as an assistant coach for the girls’ basketball team. That same summer he returned to Ohio, where again became an assistant coach for YWCA girls’ basketball team along with working as a lab technician for one of the local hospitals. During his stay in Ohio and Michigan, he met some of the most famous Jazz musicians of all time. Because of his ability to play drums, he was asked to accompany and tour with Dinah Washington -“the most popular black female recording artist of the 1950’s”, Ella Fitzgerald, Duke Ellington, Count Basie, and many other musical legends. He enjoyed touring because he was able to meet and interact with people from all over the world. After playing in many clubs in the California area, Joseph decided to make Los Angeles his home. He loved everything about Los Angeles, especially the weather, the scenery, and the creative vibe/atmosphere. While living there, between 1960 and 1980, he held the following positions: Broker for a well-known jewelry company; Marketing manager for a national grocery chain; Engineering assistant for NASA; Building contractor; and co-owner of the “Cover Girl.” Each of these positions allowed him to travel the United States extensively. But his favorite by far was traveling internationally as a jewelry broker. Years later, Joe moved to Chattanooga, TN and worked for Chattanooga Restaurant Supply Company as a delivery truck driver. Joe was talented and good at many things. Joseph accepted Christ into his life at an early age and was of the Christian faith. He loved God and longed to know more about Him some of his favorite verses were: Psalm 31:24, Isaiah 12:2, Isaiah 26:6, and Isaiah 41:10. He was very articulate and enjoyed conversing with people from all walks of life. Always warm and welcoming, he found it easy to connect and converse with others. His favorite topics of conversation included music, traveling, history, sports, and cooking. Joseph loved life and always tried to make people smile. Joseph passed away at CHI Memorial Hospital in Chattanooga, TN on September 15, 2018. He was preceded in death by his parents, eight brothers-Clarence, George, Charles, Jimmy, Renna, Quince, Albert, Raymon, and stepson John A. Smith, III. 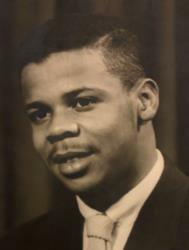 He is survived by his loving and devoted wife of 26 years, Iris Jackson; 2 stepdaughters/caregivers Audrey Smith and Mary (Luther) Peterson; sisters Willie Mae Watters, Thelma Dundy, and Sophia Cook; brothers Harvey, Ernest and Rollen (Helen) Jackson; step grandchildren; and a host of loving nieces, nephews, extended family members, and many, many, many friends. Public viewing will begin at 9 AM Saturday, September 22, 2018 at the funeral home. The family will receive friends at 12 noon and the funeral service will begin at 1:00 pm in the chapel. Interment: Greenwood Cemetery. Arrangements by John P Franklin Funeral Home, 1101 Dodds Avenue, 423-622-9995.